The Sustainability Centre is an ideal location for secondary schools pupils to learn about many aspects of sustainability, with plenty of hands on activities and challenges. The site is a rich source of ideas and information. Our curriculum linked day programmes offer a choice of topics depending on your area of interest. Activities may include making an earth oven from clay and sand; building an earth bag archway; building solar powered models; a farm tractor trailer tour over the hills of the South Downs; making shelters in the woods or ephemeral art works with natural materials. Our schools program links in to National Curriculum topics in Geography, Science, Art, Design & Technology, ICT and Citizenship. 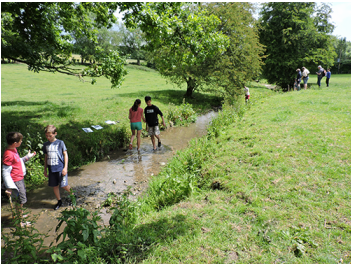 On our excellent Field Studies days students start at The Sustainability Centre, and then explore the River Meon in different local locations or the villages of East Meon and West Meon, gaining observations and data for analysis. Please see the Teachers' Pack for programme and prices. Please contact Penny Rose of our Education Team, for further information, to book a day programme or residential trip.